As the owners and founders of experiential marketing agency Envy Create, the Wylies are very attuned to forward-thinking design. So when I worked with them to convert an unfinished space above their garage to a home office, I knew the design needed to reflect their taste. A dramatic, dark color palette echoes the look and feel of Envy’s brand, with walls covered in Phillip Jeffries Black Mamba wallcovering and custom cerused pewter-finish flooring. 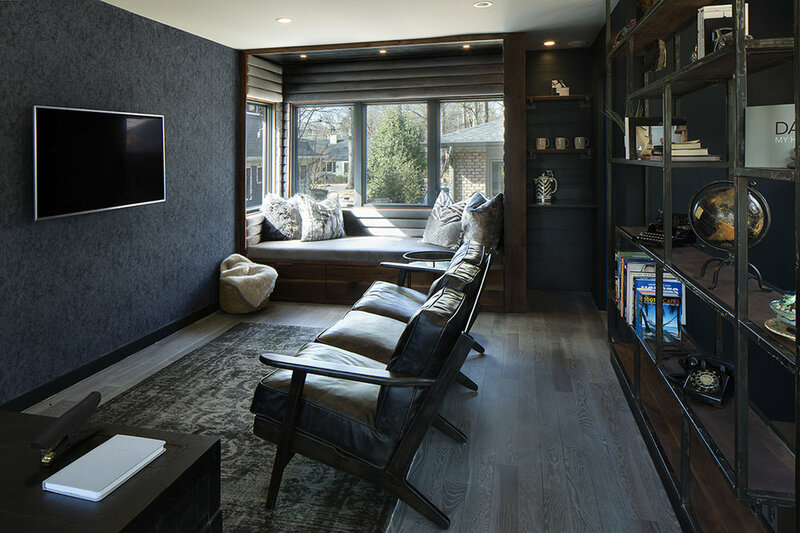 For comfort, we custom designed a window seat made of walnut and faux velvet chanel tufting, one of my favorite design elements for a sophisticated feel. 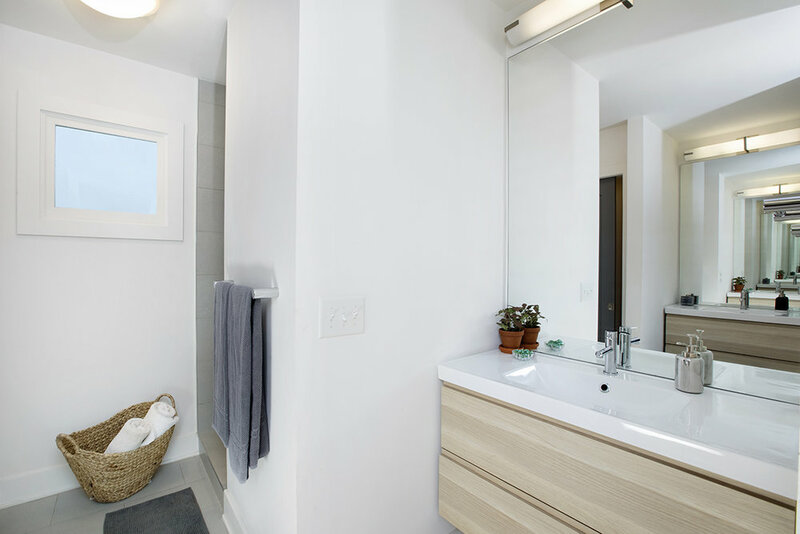 The adjacent bathroom is equally dramatic with black shiplap walls, handmade cement floors, and a custom walnut vanity. And, rather than a traditional handrail at the stairs, we designed a custom steel and walnut shelving unit. 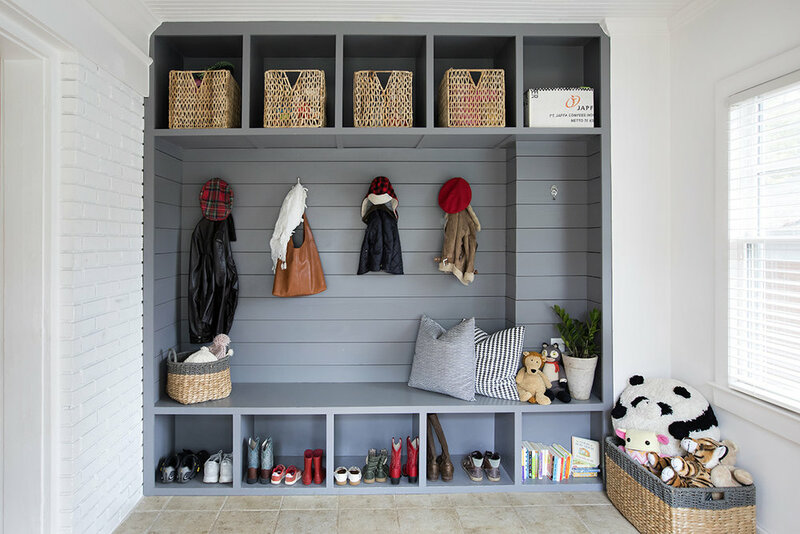 We renovated our 1920’s bungalow when our first child was born, completely reconfiguring the layout to accommodate our growing family. Opening up the kitchen, dining and living spaces wasn’t just an aesthetic choice — it also helps me keep on eye on those kiddos. 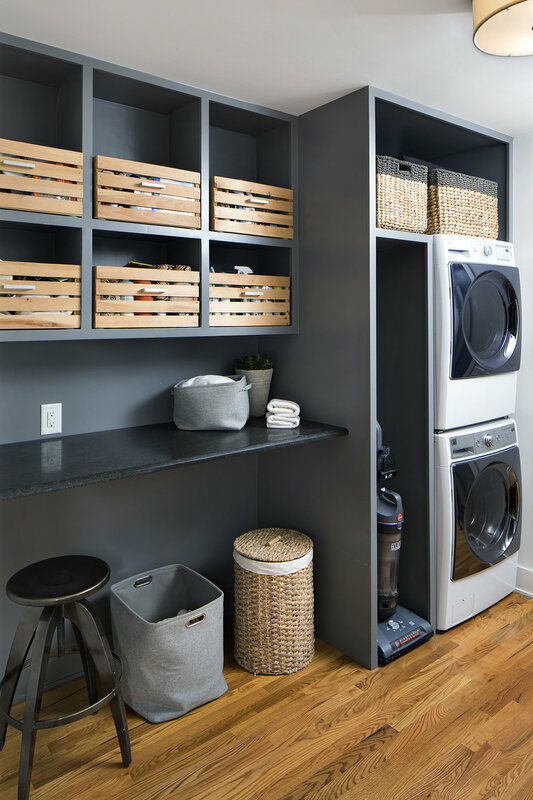 We added a new laundry room and master bedroom to the downstairs, and over the new addition, we added an upstairs space that I use as an office and yoga studio. Vaulted ceilings immediately made the space feel bigger and brighter, while cedar timber adds tonal warmth and interest. 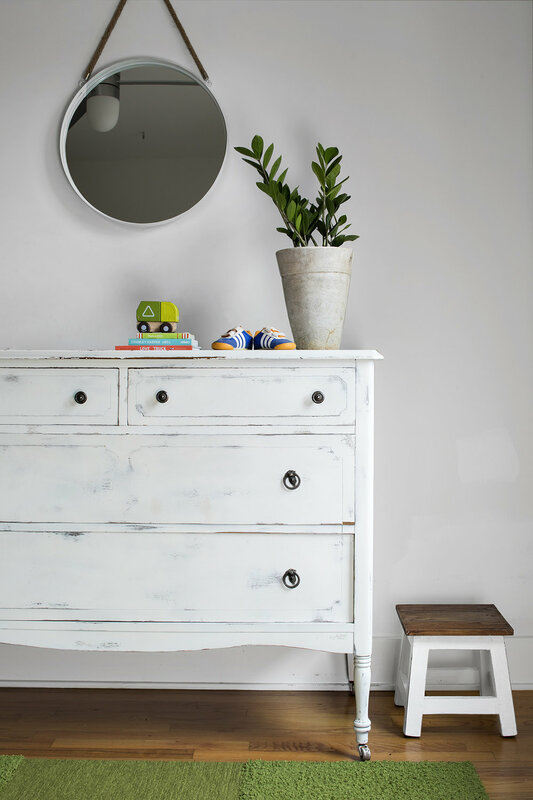 As artists, my husband and I both love to collect and display art, so white walls throughout made a perfect blank canvas while feeling clean and timeless. A good break room should be an extension of the office, but it should also be a place where employees actually want to hang out. To achieve this, we carried the Envy color pallet into the break room with black wood cabinets, sleek black granite countertops, and blue metal accent stools. For pattern, we configured glazed porcelain tiles (Puzzle, by Stone Source) at the backsplash, and on the opposite wall, installed a custom mural wallcovering with Andy Warhol’s Last Supper, supplied by Flavor Paper. In the owner’s office, we added a focal wallcovering designed by Dan Funderburgh called Power Paint: a lightbulb, representing creative thought. 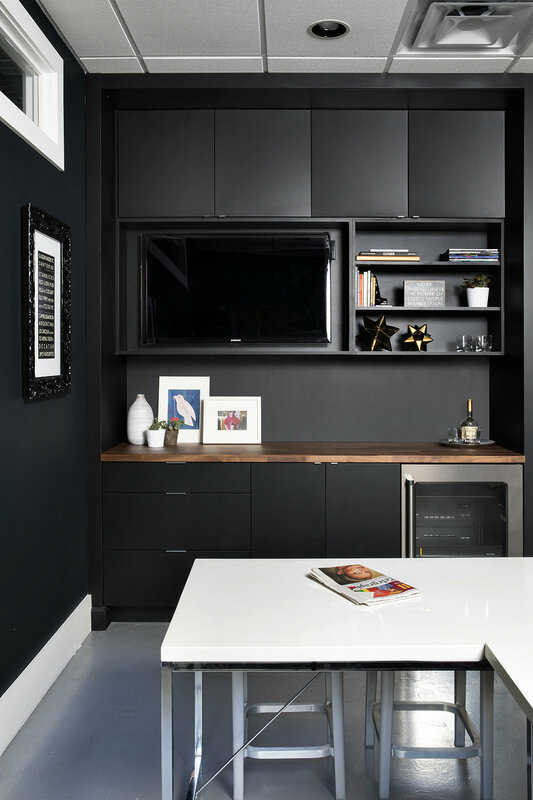 Custom millwork was designed for the TV and mini fridge, which adds a simple and sophisticated aesthetic to the space. Janet Taylor is a mother of four, a grandmother of seven, and an author of two cookbooks, and she loves spending time in the kitchen with her big family. 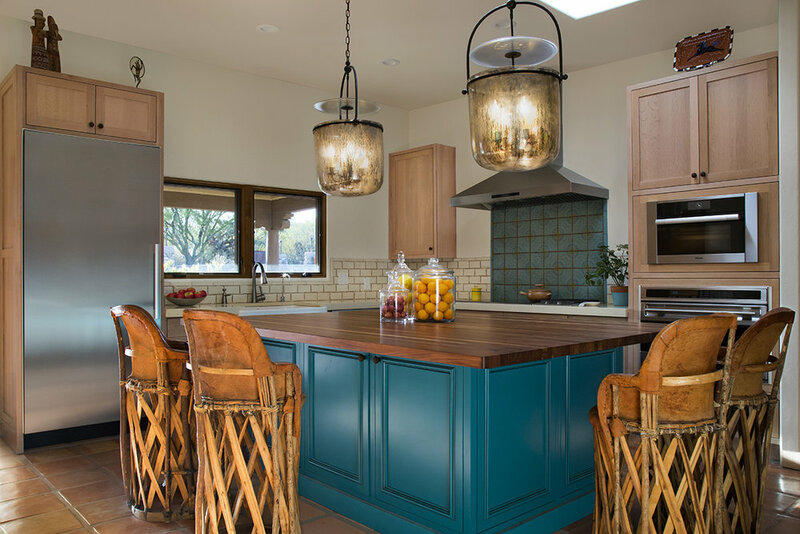 To accommodate this, she needed an update to her kitchen in her Tucson home, which is a contemporary take on classic adobe design. In keeping with the desert pallet, I worked with a local millworker who created a custom wired brushed cerused finish for the white oak shaker doors. At the island, to add a pop of color and interest, I changed the door style and color to a custom Tucson Turquoise. The countertops are a desert sand quartz, which contrast beautifully with solid walnut butcher block on the kitchen island.